Mars Medusa Region - Solar System Planets And Moons Section. 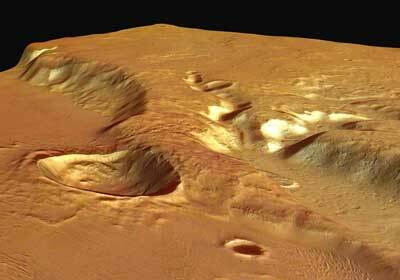 Medusa Fossae region on Mars. The European Space Agency's Mars Express spacecraft took this image of the Medusa Fossae Region on the Red Planet. This is an unusual region of Mars that was probably built up by a series of volcanic flows or rains of ash, and then partially eroded by water. Finally, a large asteroid, several kilometres across, struck the region and "splashed" ejecta onto the plateau. This image, taken by the High Resolution Stereo Camera (HRSC) on board ESA’s Mars Express spacecraft, shows part of the Medusa Fossae formation and adjacent areas at the highland-lowland boundary on Mars. The HRSC obtained this image during orbit 917 with a resolution of approximately 13 metres per pixel. The scene shows an area located at about 5º South and 213º East. The Medusa Fossae formation is an extensive unit of enigmatic origin found near the Martian 'highland-lowland dichotomy boundary’ between the Tharsis and Elysium centres of volcanic activity. This dichotomy boundary is a narrow region separating the cratered highlands, located mostly in the southern hemisphere of Mars, from the northern hemisphere's lowland plains. The remains of water-bearing inner channels are visible in the centre of the valleys and at the bottom of the massif. Superposition of the lobe-fronted pyroclastic flows indicates that the water erosion ended before their deposition. Later, a 'bolide’ impacted near the massif and the ejecta blanket was spread as a flow over parts of the plateau, implying water or ice was present in the subsurface at the time of impact.